First of all, let’s get one thing straight- this boot pack contains some absolute bangers. 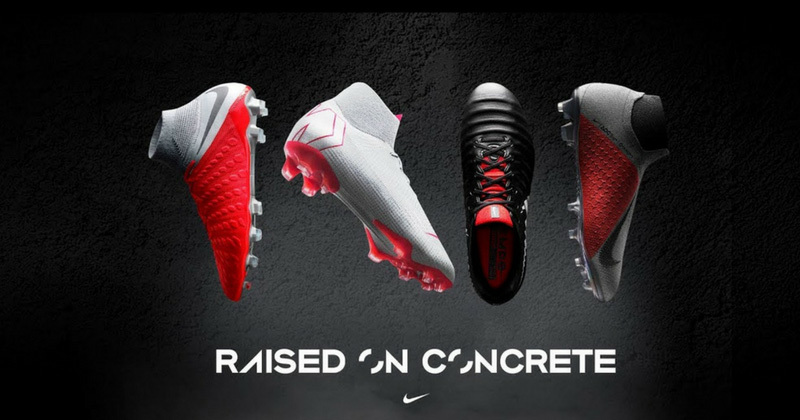 The ‘Raised On Concrete’ collection is Nike’s first on-pitch boot drop of the 2018/19 season, as some of their most popular silos have been given fresh colour updates ahead of the opening weekend. If that wasn’t enough, then they’ve also introduced an innovative new silo that could revolutionise the world of football boot design forever. Set to be worn by the likes of Kevin De Bruyne and Philippe Coutinho, the Nike PhantomVSN has been released amidst a whirlwind of media hype and awesome promotional material. Following its inclusion in the black-out ‘Stealth Ops’ pack earlier this month, it’s the new ‘Raised On Concrete’ version that will be introduced to Europe’s top leagues next week. The new PhantomVSN: designed for the game’s elite playmakers. Featuring: @Phil_Coutinho, @DeBruyneKev, Leon Goretzka, @MalPugh & @frankirby. The new PhantomVSN features a stunning light grey and red colourway, with black detailing allowing the Swoosh to stand out prominently on the side. You don’t have to be a genius to see that concrete is a running theme throughout this boot pack, but the splashes of red on the PhantomVSN are used to highlight the enhanced control on the in-step. Featuring Nike’s new Quadfit technology, these boots will seamlessly conform to the shape of the wearer’s foot, providing the most stable and comfortable fit we’ve seen in a long time. Since the top players still have a love of laces, Nike have implemented an innovative Ghost Lace system to create the illusion of a completely laceless upper. It’s a fantastic football boot. As Nike repeat their rallying cry of #AwakenThePhantom, this is a chance for the next generation to take their street-skills onto the pitch. The Nike PhantomVSN is just downright handsome. Completing the collection are new looks for the Hypervenom, Mercurial and Tiempo, as Nike’s biggest-selling silos get the street treatment in their own concrete-inspired colourways. 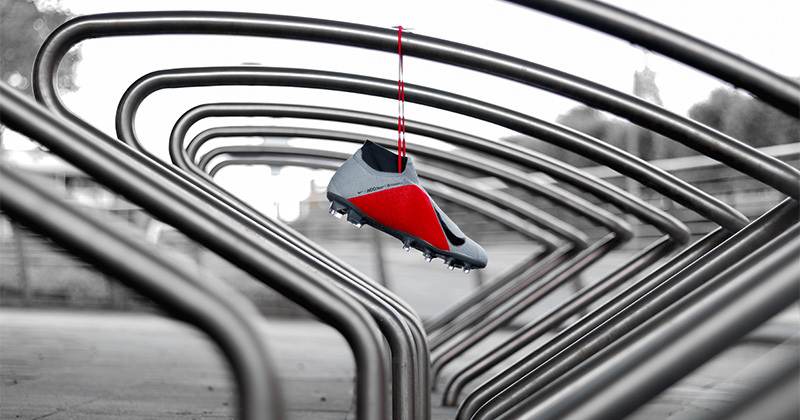 The Hypervenom is by far the boldest design of the new pack, drowning in vibrant shades of red as the concrete-greys take a back seat. These boots are worn by some of the most lethal strikers on the planet, and Nike’s current-gen Hypervenoms have been engineered to increase power and stability. So best of luck to anyone facing Harry Kane this season. In contrast, the ‘Raised On Concrete’ Tiempo opts for a black colourway, in a design that doesn’t really follow the same theme as the other boots. Coming complete with red detailing and the signature k-leather upper, this is yet another classic Tiempo which is sure to leave fans purring. 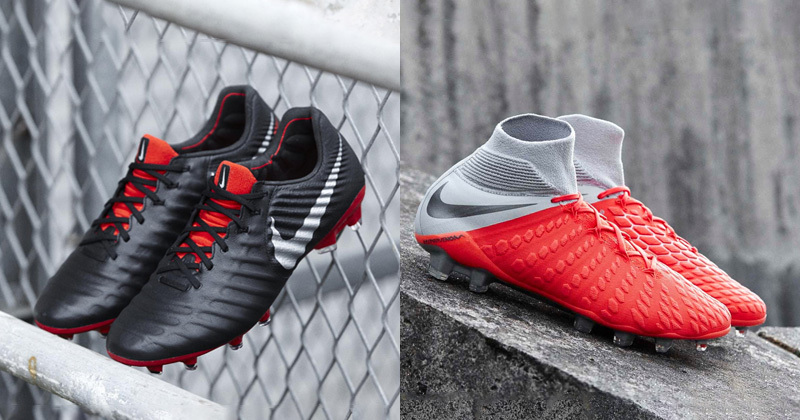 The ‘Raised On Concrete’ Tiempo (left) and Hypervenom (right). Image by Nike. Despite its simple appearance, though, the Tiempo still incorporates some truly innovative boot tech; resulting in enhanced comfort and secure lockdown of the foot. Designed for players that need to stay composed on the ball, there’s a reason the likes of Sergio Ramos and Gerard Pique will be showing these bad boys off this season. Maybe Loris Karius could use a pair? As for the Mercurial, Nike’s most popular boots will kick-off the new season drenched in concrete shades and exuding strong street vibes. Going big on the light-grey colourway, the ‘Raised On Concrete’ Mercurial features stunning red detailing and the signature 360 Flyknit construction that was so popular last season. With Alexis Sanchez and Kylian Mbappe due to show these off in the coming weeks, we can’t help but wonder whether these boots will be worn by Cristiano Ronaldo on his Juventus debut. Let’s hope so, eh? You can compare prices on the new Nike football boots right here at FOOTY.COM. Find the best deals with us and kick-off the new season with some extra change in your pocket.